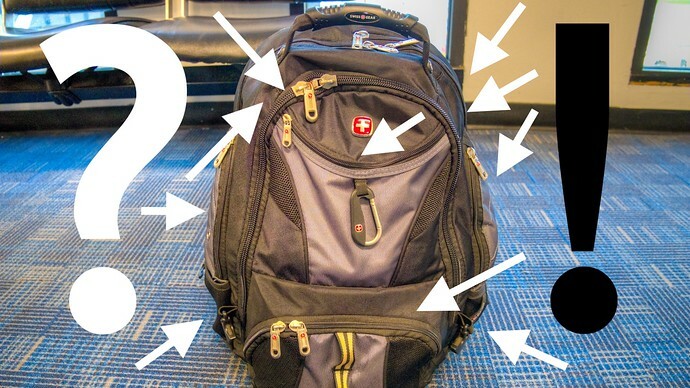 The SwissGear Scansmart 1900 is a durable backpack with a lot of benefits for most travelers that leads to one big drawback for everyone else. One of the most popular travel backpacks, especially for people who carry a lot of electronics, the Scansmart 1900 has pockets for just about everything. Plentiful pockets is not surprising for a brand associated with functionality, but the Scansmart’s dividers rob it of a large main storage compartment, meaning it’s a great backpack if you only use 75% of it. 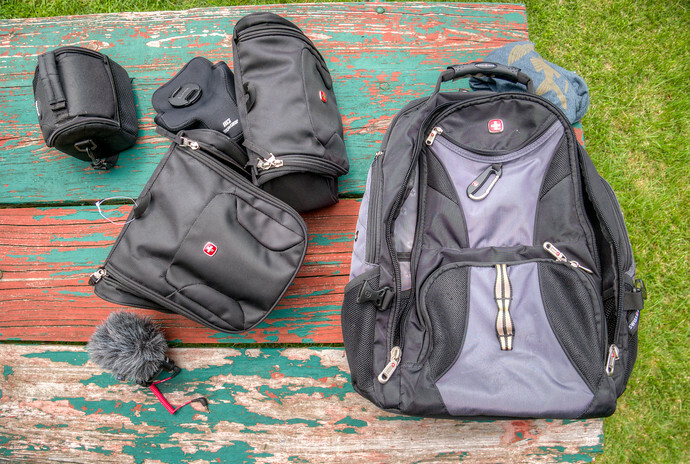 The SwissGear line of backpacks are designed to last – I used the Synergy for over 10 years – and have been using the 1900 as my primary electronics backpack for the past 18 months or so. (I switched because I needed a larger bag to carry this stuff.) The 1900 has held up very well over the extreme amount of travel I’ve done, though there are small indications of imperfection I never noticed on the Synergy. A slightly loose plastic logo on the handle and a few errant strings in the stitching are things I wouldn’t even mention for other backpacks but SwissGear have set their own bar very high. Still, the Scansmart will last, despite my constant over-stuffing of this bag, the seams have held strong and survived where many other backpacks I’ve reviewed wouldn’t. Originally I moved to the Scansmart 1900 when I picked up a Mavic Pro drone. I organized the drone, as well as my Panasonic Lumix G85, in two SwissGear toiletry kits. They fit perfectly into the front main compartment of the 1900 but two additional dividers in that compartment steal space if they’re not used. In other words, a notebook, cable organizer, and some other small items would fit well; it’s when you stuff the main compartment those dividers force the bag into an awkward, uncomfortable shape. Sure, the Scansmart 1900 can handle it, though your back might be slightly sore after a long journey. iOS Or Android: What's The Best Mobile Operating System For Travelers? Then, there’s the biggest complaint I have about the 1900: the thick dividers between the laptop compartment, tablet compartment, and main compartments. Those dividers take up space, again, which is fine if you’re not going to really fill the main compartment. Using the laptop and tablet compartments push those bulky dividers forward into the main compartment and if you try to fill it up too much your backpack will look like a water balloon ready to burst. Alternatively, the North Face Recon I’ve previously reviewed, has roughly the same internal capacity though allocates much more space to the main compartment. It’s got one roomy laptop pocket in the main compartment without cutting it up into smaller sections. For travelers with a lot of small items, the Scansmart 1900 might be a better backpack, because it’s designed not to be filled anywhere near capacity. The Recon on the other hand, has a large main compartment that can easily fit a DSLR, small drone, or otherwise be jammed with clothes when you don’t feel like packing properly. The Scansmart 1900 is a large backpack designed for small things, best compared to the Dell Premier backpack, if you’re not planning on pushing your bags limits. NextRoad Tested! Is The DJI Mavic Pro Still Worth Buying In 2018?